The PokerStars Australia New Zealand Poker Tour Sydney $2,200 AUD no-limit hold’em main event has come to a close, and the champion is Angelo Hanataj. The tournament attracted a total of 446 players, and the prize pool was worth $892,000. The top 54 players received prize money, and Hanataj walked away with the top prize worth $219,432. The final table played down quickly at the Star City Casino in Sydney on the final day of the tournament. It took just four hours for the final heads-up match to be set between Hanataj and Mike Ivin. When play began, PokerStars qualifier Michael O’Grady was the chip leader, but he suffered numerous setbacks en route to a fourth-place finish. Hanataj took a 3-1 chip advantage into the heads-up final, but he quickly lost the lead and at one point he faced a 5-1 chip disadvantage. Hanataj then climbed back into contention against Ivin during 90 minutes of heads-up competition. On the final hand, Ivin held 7-6 in the hole on a board that read A-9-8-10-Q, but Hanataj held pocket jacks. Hanataj won the hand with the higher straight to win the tournament. Notable cashes in the event outside of the final table included Team PokerStars pros Lee Nelson (47th place) and Tony Hachem (29th place). 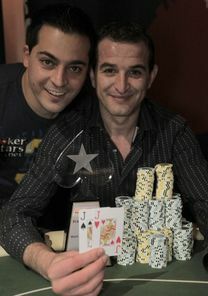 Hachem increased his lead in the ANZPT player of the year race for season two to 151.65 points. The next closest competitor is Peter Aristidou with 88.3 points. The next ANZPT event will take place in Canberra from June 11-14.